I know, I know, most of us have memories of our mothers telling us to stop playing with our food. Well, I’m here to tell you that it’s time to throw that out the window, or actually, stop just short of out the window at the windowsill. Although we have a serious shortage in the snow department this year, the temperatures, although tropical for a Minnesota winter, are hardly “growing season” temps. That, however, should not stop you from growing plants, herbs and veggies! No, I’m not crazy. Okay, well, maybe a little, but that’s beside the point. Anyway, during the winter months when I can’t be outside in the garden I tend to focus on what I can grow inside. 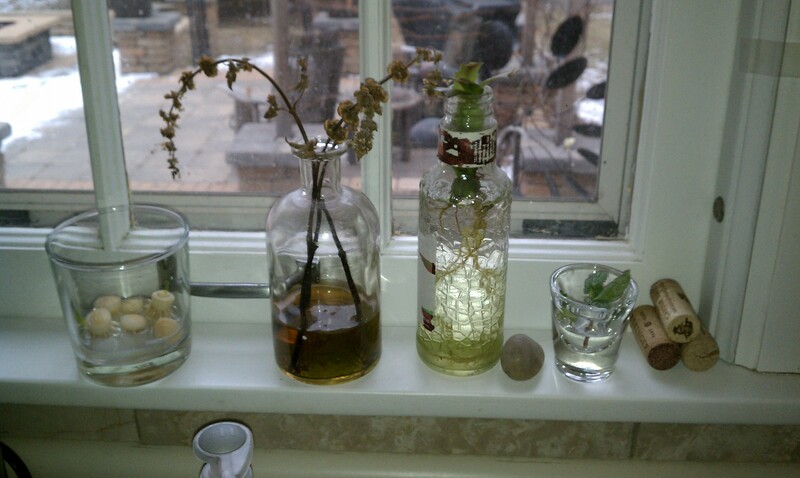 Typically my kitchen windowsill is loaded with any glass, bottle or jar I can get my hands on, and inside them I’m growing whatever strikes my fancy. In addition to the Garlic Experiment, my current windowsill experiments include: green onions/scallions, basil, a Christmas cactus, spearmint, leeks, a maple tree, aloe vera and an avocado pit. 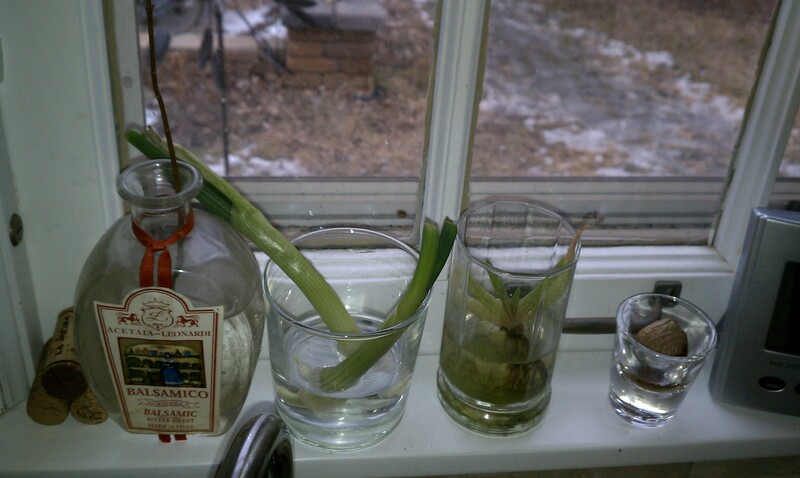 I also have herbs growing in the bathroom, but since that’s technically not on the windowsill, I’ll save that for later. 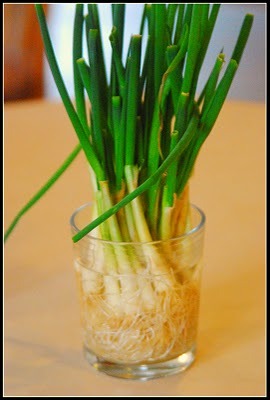 As I was prepping the onions, instead of discarding the ends, I set them aside to prepare for the Green Onion Experiment. 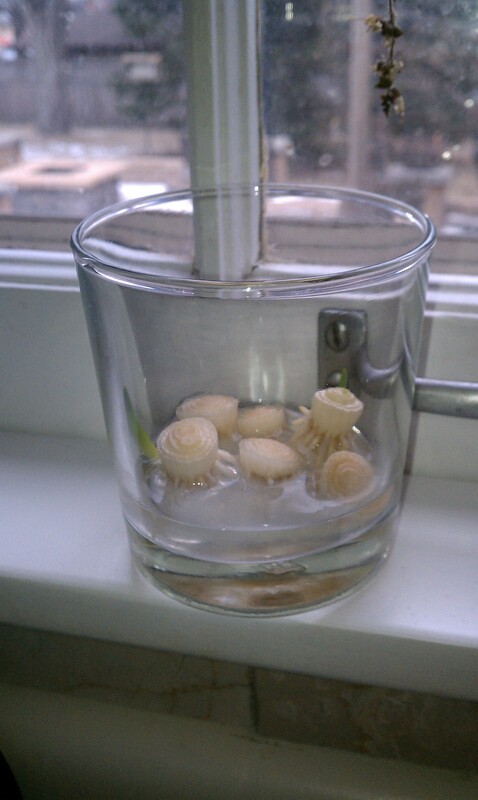 After finishing my dinner prep, I grabbed a glass and set my onions in the bottom. Ha, I make it sound so easy. Actually I fought with the little buggers quite a bit to get them to stand upright. They already have little roots attached when you buy the onions in the store and since they aren’t all the same length it made them a little tippy (next time I’ll trim the trouble makers). Anyway, once upright, I added a tiny bit of water, just enough to cover the roots, but not so much as to cover the onion itself or I would end up with a glass of foul-smelling rotting plant material, which is not my goal. I was a little concerned that this experiment might not work so well because after I started this experiment I checked into the source of the Pinterest photo. Turns out, they only used the greens for their cooking and had the entire base of the onion left over so they had really fast results. Since I cook with nearly everything but the roots it made me a little nervous, because I really didn’t have a lot of plant material to work with, but I trusted in my plant biology knowledge, sent good sprouting vibes to the little guys and set them on my kitchen windowsill. I should mention that my windowsill experiments only receive part-sun exposure because it’s an East facing window, but it’s where I do a lot of my propagating because I can watch it every day. They tend to do fine, at least until they get a little larger and need more light in which case I’ll either transfer them to a window with better exposure (South or West facing) or under plant lights. 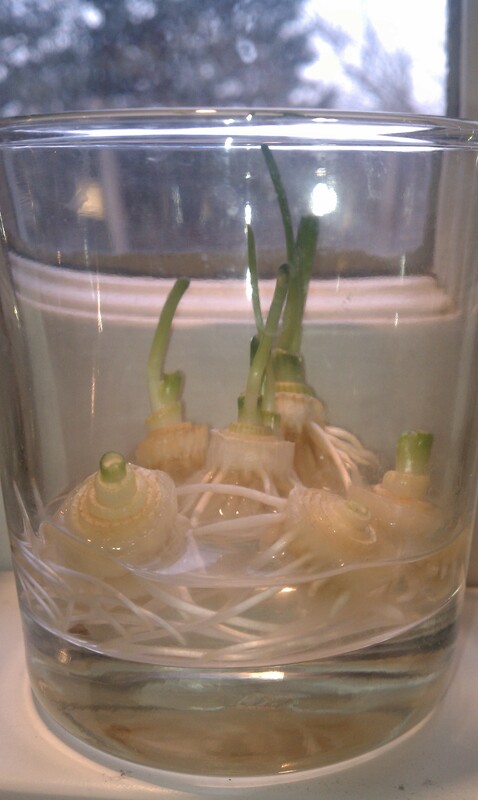 Amazingly, it didn’t take too long for the roots to start growing and shoots to form. 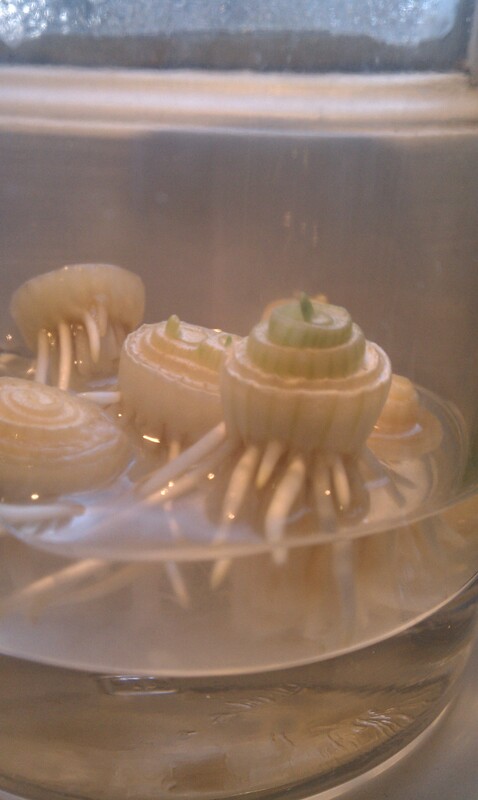 By the first day, I could see little green specs on the top of one onion. And by Day 2, 3 and 4 it became more and more visible (but not so much with the camera.) 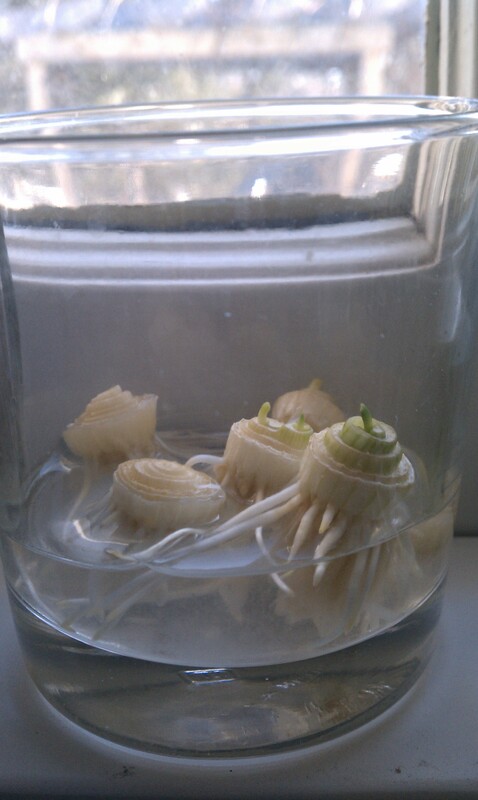 By Day 5, however, shoots can be seen on more than one onion. And now, about 10 days out, it looks like the experiment is a success. In a few weeks we’ll have a nice crop of green onions. As a side note, I change the water every couple of days to everything fresh. 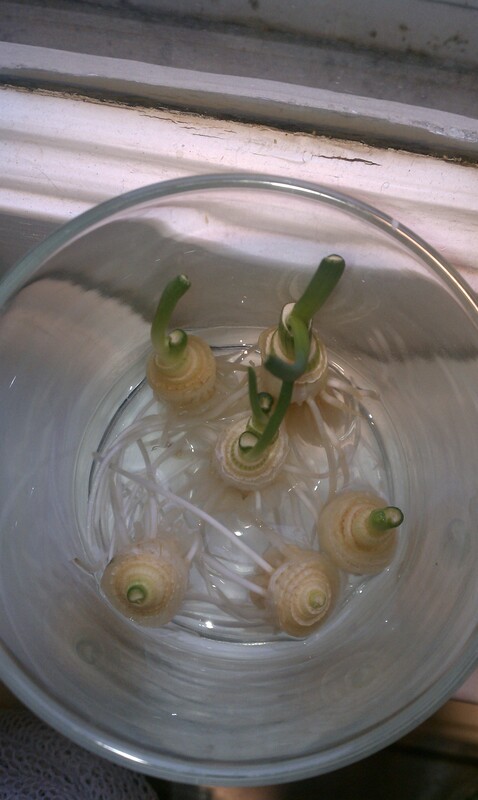 I’ll continue to post on the Green Onion Experiment as it progresses. In the mean time, stay tuned for leeks, basil, avocado, Christmas cactus, Maple tree, aloe vera and spearmint and… whatever else might strike my fancy along the way! Now, go play with your food, would you?! What now? Water ’til winter! 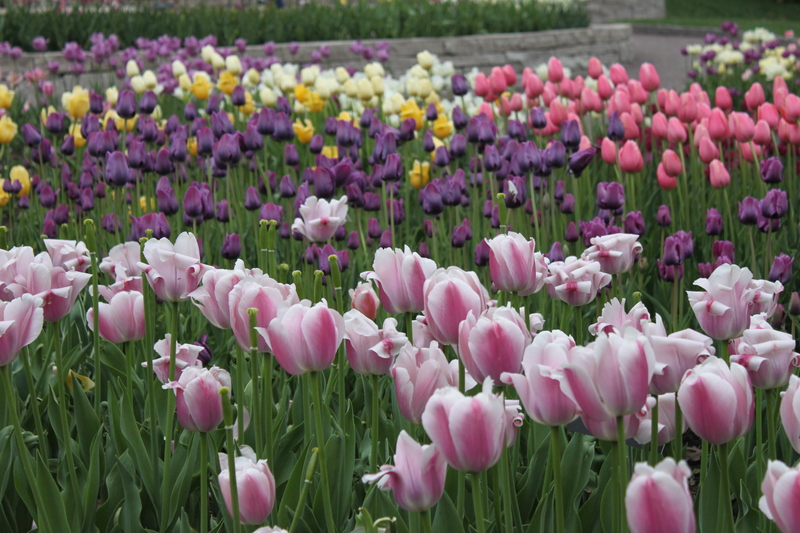 As the temperatures drop and the gardening season fades….. wait, WHAT?!?!? Remind me, what is the date? What season is this? It’s October… in Minnesota… and it was 80 degrees yesterday, its supposed to be 85 degrees today, 80 degrees tomorrow, the day after tomorrow and the day after that. It’s pretty odd to have gorgeous fall color and 80 degree temps in Minnesota right now, but I’ll tell ya what, I’ll take it! Honestly, when the cool weather hit a couple of weeks ago I was totally ready for fall. I absolutely love fall, but I also know what follows it, so if Mother Nature offers a few extra days of summer you won’t hear me complaining! I’ll be honest though, it’s kind of confusing. Ummm… what now? Should I be planting or doing fall clean-up? The answer would be BOTH! 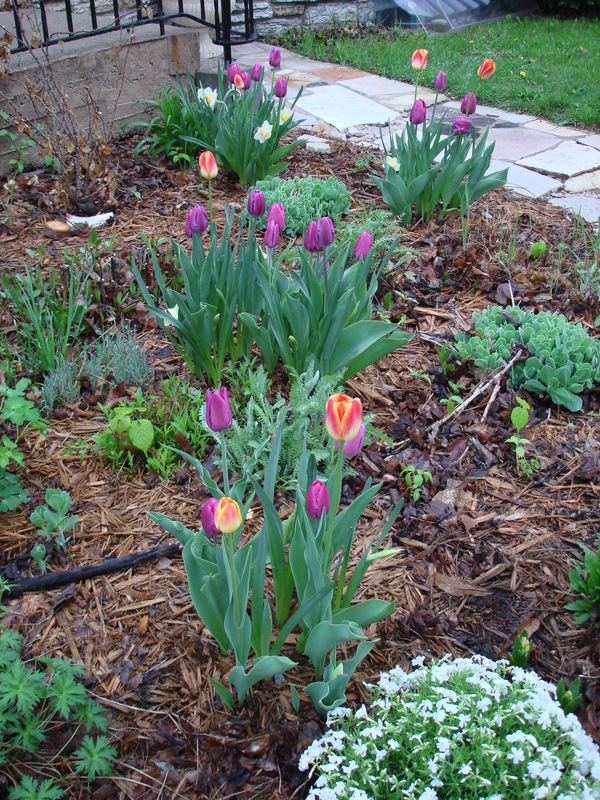 Now is an ideal time to plant spring blooming bulbs like tulips, daffodils, hyacinths, grape hyacinths, scilla, crocus…. you get the picture. It’s also the perfect time to plant garlic! Okay, so what if you’re really not into either of those and nice weather or not, you’re done gardening for the season? Then what? It’s really easy to call it quits this time of the year. A lot of people are just worn out and their gardens are “done”. As much as it is tempting to let things go, it’s incredibly important to continue watering trees, shrubs and perennials to help them prepare for winter. Remember the Water, water, water! post back in June? Well, here we are again! 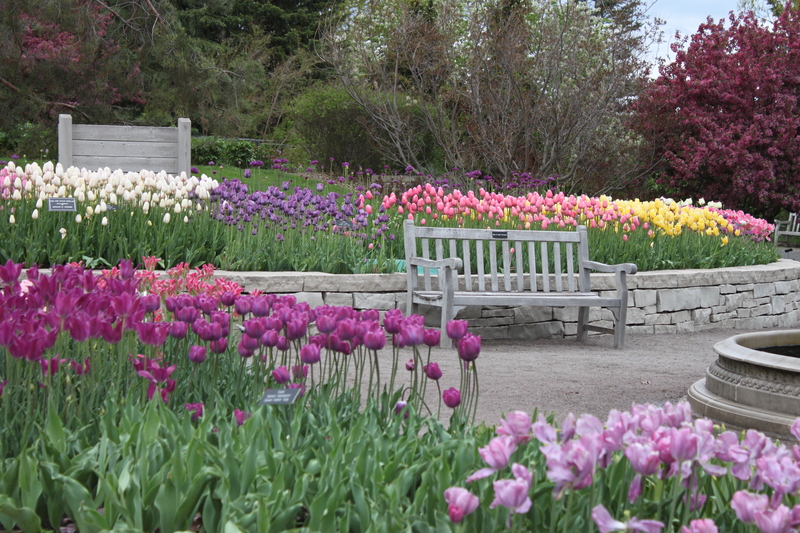 Trees, shrubs and perennials are the backbone of our yards. They provide structure, shade, protection from winter winds and “winter interest” and yet they also tend to blend into the background and get forgotten. I, for one, am guilty of taking them for granted and almost forget that they need attention, especially in the fall. The past few weeks have been really dry and dry plants get stressed. Stressed plants have less of a chance of surviving the winter and a better chance of experiencing winter die-back. Water gives them strength, helps them better survive frost and winter temps. So how late in the season should you water? Water until the ground is frozen (typically some time in November). Seriously. Water until you can’t water any more, then put away the hoses and shut off the faucets. You’re plants will thank you.